The Hawker Memorial Hospital was erected to commemorate those from the district who died or were killed in World War One. It was originally called the "Great Northern War Memorial Hospital". The name was changed in 1998. A meeting was convened to discuss how the residents could fittingly recognise the services of the men who had died in the war. A hospital was decided upon and a large sum of money was collected. The foundation stone was laid on the 7th June 1923 by the Chief Secretary, Sir J. G. Bice and the hospital was opened by the Premier, The Honourable J Gunn on the 20th September 1924. 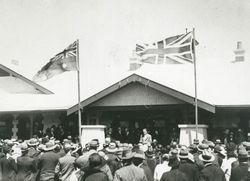 The foundation stone of the Great Northern War Memorial Hospital at Hawker was laid on Thursday, June 14, by the Chief Secretary (Sir John Bice). Mr. Manson, who presented Sir John Bice with a silver trowel, said the residents had wished to make some suitable recognition of the services of the men of Hawker, who had made the supreme sacrifice. They decided to build a hospital, and the collections had reached a good sum. Chronicle (Adelaide), 23 June 1923.